Pinarello - that significant 1984. 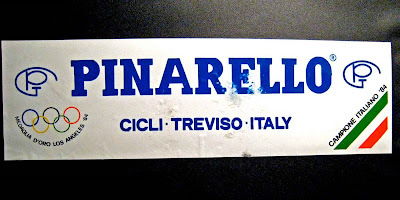 A fond memento of my 1984 visit to Cicli Pinarello! Nineteen eighty-four was the last time I visited Treviso, Italy. My interest in cycling opened up with a visit to Cicli Pinarello. I knew very little of the bicycle maker. 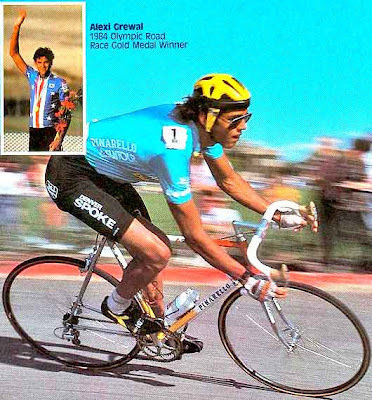 Frankly, my only knowledge was that American Alexi Grewal rode on what I remember as a Montello and winning the 1984 L.A. Olympics Men's road race. And that was mainly it. 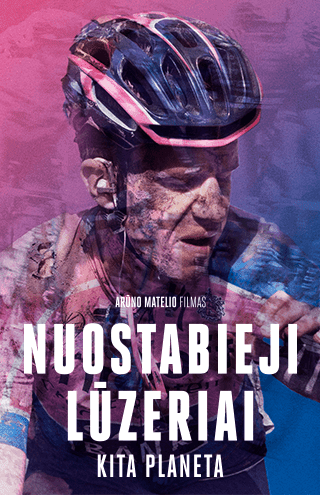 So, inside I went and entered into the fascinating Italian world of cycling. I must've smiled and grinned like a kid as Giovanni Pinarello gave me a tour of his wonderful bicycle factory. I saw a replica Montello model that Grewal championed his gold medal performance on. 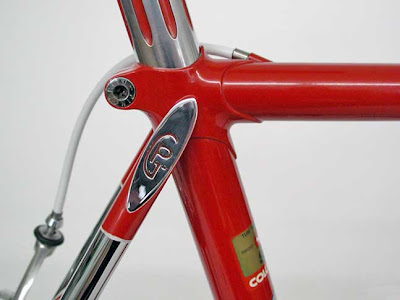 I wanted to show these exquisite images of the 1984 Pinarello Super Record with Columbus SLX tubing and microfusion lugs in the gorgeous rosso corsa. 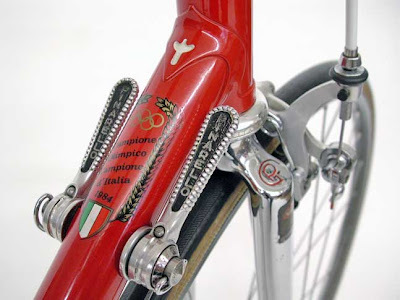 Marvelously equipped with Campagnolo Super Record. That year Pinarello proudly portrayed a 'Campione d'Olimpico Campione d'Italia 1984 crest.' 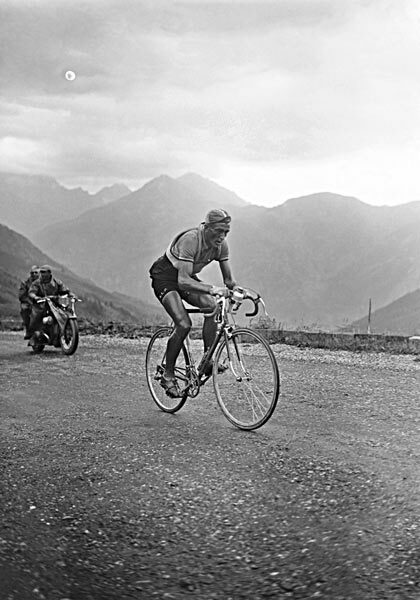 Vittorio Algeri won that right to wear the Italian National Champion jersey riding for Metauro Mobili Pinarello. A nice memory from Pinarello, twenty five years ago! 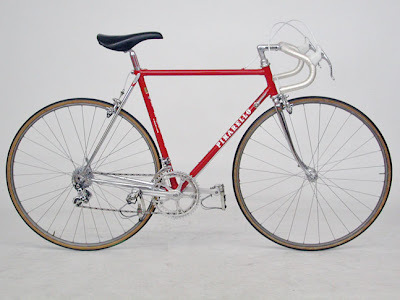 The 1984 Pinarello Super Record SLX. 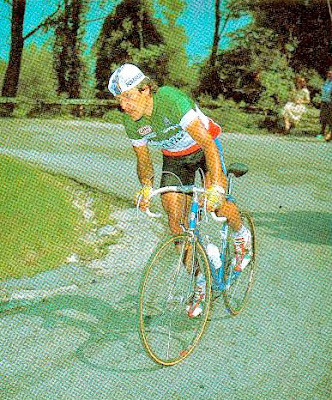 1984 Italian champion, Vittorio Algeri on a Pinarello Super Record SLX. I actually own one of those Montello SLX bikes, with the Tri-color fade paint job that Alexi rode in the Olympics! It's a great bike and I still ride it from time to time. thanks for posting those pics! Awesome. I own one, also...but mine has the oval 'aero' tubing. The bike Alexi won with had round tubing. I still ride mine, frequently. I hope one day I can get a montello sLX! Pinarello is one of my favorites! Just stumbled upon this. 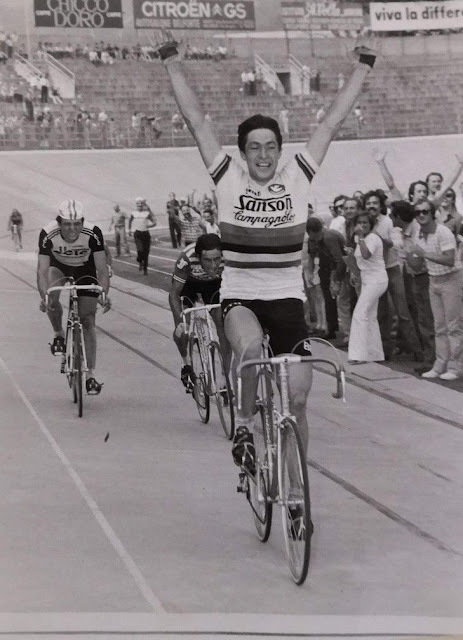 I also visited Pinarello in Treviso in the summer of '84. I've got the same catalog and sticker! I had just been liberated from a German language study program and hopped the train to Italy. He couldn't speak English, and I couldn't speak Italian, but we could both speak German and communicated that way. He fixed me up with his daughter and we went out a couple times. She took me to a relative's house and they kept asking me if I knew all of these American movie stars they'd heard of (but I hadn't). It was a fun experience and I ended up leaving with an SLX Montello painted like Alexi's but with grey where his colored bits are. I think the whole bike (Campy SR) and kit cost something like $400. That's an adventure in itself going to the relatives,do you still have it? No, sadly the bike is gone. I got tired of the 80's paint job and had it repainted in the 90s. In a fit of attempted organization, I decided to sell it and have only one bike, a cross bike. Of course I regret it today, but it was sold on ebay about 12yrs ago. 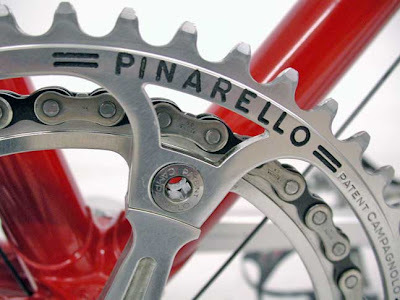 I've got Pinarello Montello as one of my saved searches in ebay, so if it's ever listed again, I'll catch it.